SUBHEAD: We couldn't afford to take care of Mother Earth anymore. Excuse us while we turn the Pacific Ocean into a radioactive ashtray. Image above: Looks like fun! 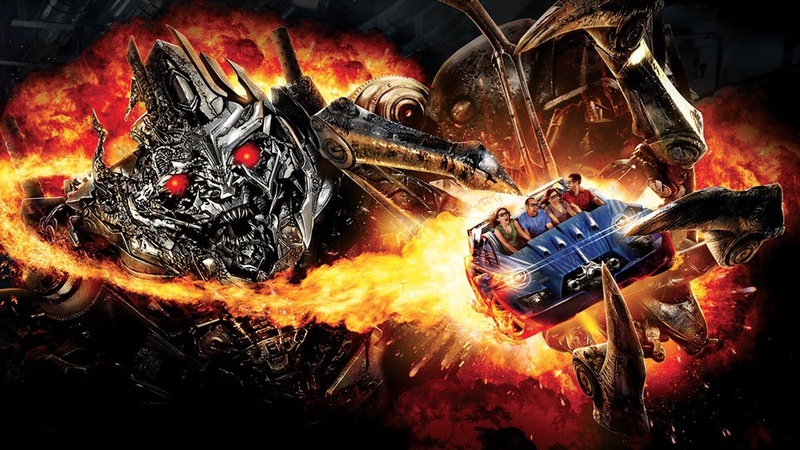 Poster for ride at General Electric's Universal Studios Hollywood theme park that features the sentient robot Megatron (the Decepticon) as he hunts down you and your family. 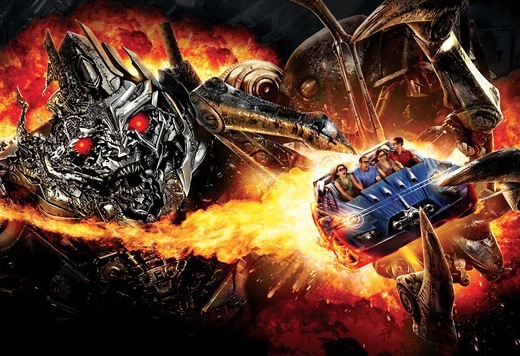 From (http://www.universalstudioshollywood.com/). Click to embiggen. Earthday has devolved since, especially as our problems with the destruction of the Earth's environment have grown. I guess it is hard to keep up the good fight in the face of the decimation of your allies. In any case, this year on Earthday our progressive President, Barack Obama, is not attending any Earthday ceremonies. Instead Obama is on his way to Japan to assure its right-wing president that the USA's Pacific Pivot is still on track to fulfill its promises: Contain China's military and economic expansion; deliver the Trans-Pacific Partnership (a corporate globalist takeover) and insure American military allies their full spectrum dominance of the Pacific Ocean. The demonstarion of which is the RIMPAC 2014 naval exercises this summer. Oh yeah, this is the year of the 24th biannual Rim of the Pacific navel military exercises. That's the big military operation that will test coordination, communications, equipment, and weapons for over twenty Pacific Rim nations from Asia, Australia, North America, and South America. Even Norway will attend this year. The whole shebang means the destruction of uncounted (only estimated) numbers of marine mammals, and other ocean mega-fauna. The US Navy and its nuclear aircraft carrier groups lead this parade of death into Pacific Ocean leading to its environmental destruction. The US Navy announced in February that the USS Ronald Reagan will likely participate in RIMPAC 2014. This radiation contaminated ship may end up being the poster-child for this confluence of bad karma in the Pacific Ocean. Toxic seawater was sucked into the ship’s desalinization system, flowing out of its faucets and showers — still radioactive — and into the crew member’s bodies. “We were probably floating in contaminated water without knowing it for a day and a half before we got hit by that plume,” said Lindsay Cooper, whose career as a third-class petty officer ended five months after the disaster for health reasons. Snow falling on Navy ship caused by Fukushima radioactive steam… “Is that aluminum foil I taste?” – Cooper, who worked up to 18 hours at a time on the flight deck loading supplies onto a steady stream of aid helicopters for four days, all the while drinking out of the two-gallon pouch of water hooked to her gear belt. By the time the Reagan realized it was contaminated and tried to shift location, the radioactive plume had spread too far to be quickly outrun. All the while crew members had been suffering from excruciating diarrhea. The USS Reagan had to go to a Navy drydock in Bremerton, Washington for radiation decontamination. It spent a year and a half in Washington before being returned to its home port of San Diego. There it has sat since. The crew that experienced Fukushima has been swapped out and the USS Reagan has been assigned to Yokosuka, Japan in 2015 after it is done taking part in RIMPAC 2014. What does RIMPAC 2014 American Hegemony, the Fukushima Daiichi Nuclear Meltdown and TPP Corporate Globalism have in common? They are all aspects of the same thing. They all depend on nuclear power and weapons. Japan, the third largest economy behind America and China cannot profitably run its heavy industry without nuclear power. Hitachi, Mistubishi, Toyota, Nissan et al, cannot afford to run their manufacturing operations without restarting Japan's nuclear plants. The USS Reagan is a Nimitz Class aircraft carrier leading on of those carrier groups that dominate theworld's oceans. Nimitz class ships are the largest warships ever built. each is powered with two General Electric Corporation pressurized water nuclear reactors. Other nuclear ships and subs accompany them. They are armed with nuclear weapons and bombs and use depleted uranium tipped shells in their cannons and machine guns. Fukushima Daiichi is a site of six General Electric boiling water reactors. They are gone but Japan has about 50 sites that have suspended operations. Right-wing Prime Minister Shinzo Abe is trying to get them started against the will of the Japanese people who seem to have rejected nuclear power. I'm sure American President Barack Obama sympathizes with Abe and would like to get the nuclear power industry running again in Japan and expanding again in America. The General Electric Corporation has a lot of manufacturing done for itself in Japan. It also is a major player in the Military Industrial Complex. But unlike many other arms "providers" (like Boeing, or General Dynamics or Ratheon) General Electric is also in the entertainment, leisure, and consumer industries. They own National Broadcasting Corporation, MSNBC, CNBC, Universal Studios, Universal Parks and Resorts, etc. The GE brand loves the TPP with its fascist corporate control of intellectual property, trade names and brands. The nations participating in the TPP talks are many of the same players involved with roiling the Pacific Ocean with explosives and destructive energy waves through RIMPAC exercises. The TPP purpose is to protect the interests of corporations and their intellectual and otherwise controlled property rights above the mere interests of governments or their peoples. How do you ensure those corporate rights and privileges - NUCLEAR POWER and NUCLEAR ENERGY. Sorry Mother Earth. We just couldn't afford to take care of you anymore. Excuse us while we turn the Pacific Ocean into a radioactive ashtray.